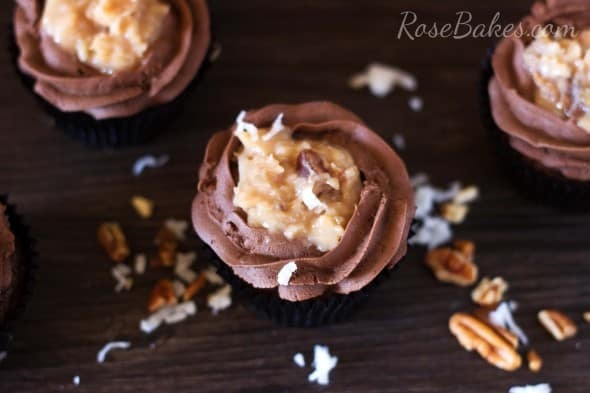 German Chocolate Cupcakes. What a fantastic idea, right? I’m gonna step back a few steps and tell you… I’ve struggled with blogging for the past couple of weeks. Early November was insanely busy (3 wedding cakes, a groom’s cake and 2 birthday cakes all in one weekend) and I sort of felt like I was drowning. Every time I’d try to write, I’d just get stuck. This week my uncle asked for a German Chocolate Cake for his birthday. He’s been sick for several months and although I’ve only done German Chocolate cakes a few times, I was happy to make it for him! And since he specifically requested the frosting (and lots of it), I decided to make the Coconut Pecan frosting homemade. You see, usually when I do a German Chocolate Cake, I cover it with Chocolate Cream Cheese frosting. And when I made German Chocolate Cake Balls, I used the canned frosting. But yesterday? I made a real cake with real homemade Coconut Pecan Frosting. And it was sooooo good! In the process, I had some extra batter and frosting, so I decided to make some cupcakes. And I’m gonna go out on a limb and say that I like the cupcakes better than the cake. Because in addition to the Coconut Pecan Frosting… I added some Milk Chocolate Buttercream. Better, right? 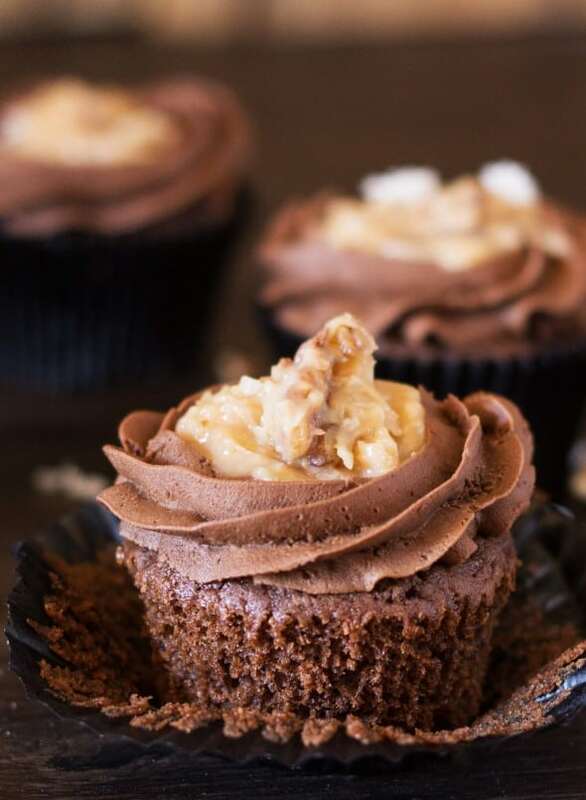 Because Milk Chocolate Buttercream makes everything better. Anywho… I’m really, really loving the way these cupcakes turned out and I’m seriously considering adding them to my regular rotation of cupcakes. They’re not hard to make and they’re just plain delicious. 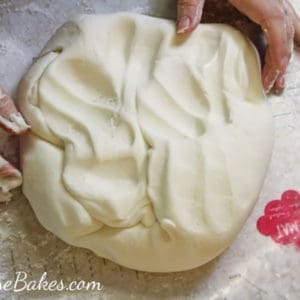 As a side note… have any of you decided that you liked something that you thought you hated after you started baking regularly? I used to hate almond flavoring, but now this White Almond Sour Cream cake is one of my all-time favorites. I also used to hate coconut in just about anything baked… and now… I’m sort of loving it. Italian Cream Cake? The bombdiggity. 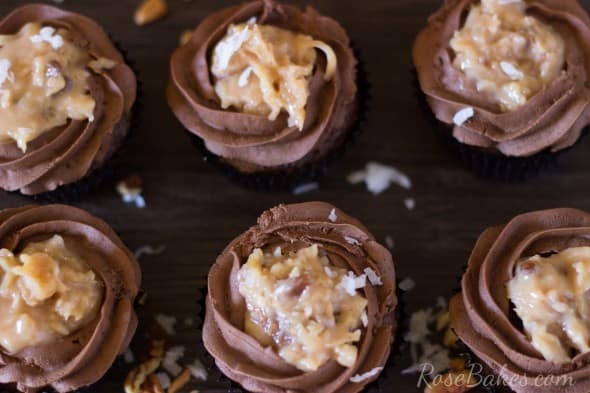 And these German Chocolate Cupcakes? So, so addictive. These recipes were only slightly adapted from The Cake Mix Doctor Returns. If you like doctored cake mix recipes, I cannot recommend enough all of Anne Byrn’s books. I have three of them and they’re fantastic!! Preheat your oven to 325°F and prepare your cupcake pans. I like to use glassine liners. Break the milk chocolate bar into pieces and place them in a microwave safe dish. Microwave on high for 1-2 minutes, stirring every 30 seconds until the chocolate is completely melted. Scoop into your cupcake liners (I like to use a 2 tablespoon scoop to fill my cupcake liners… I do a heaping scoop per cupcake), and bake for 19 minutes. Place the evaporated milk, sugar, butter, egg yolks and vanilla in a large boiler over medium heat. Cook, stirring constantly, until thick and golden brown. This took about 12 minutes for me. Remove from the heat, stir in the coconut and pecans, and allow it to cool to room temperature (I stuck mine in the frig – it got a little too thick, but it worked!). It’ll take at least 30 minutes to cool to room temperature if left out. Chop up the chocolate bars and place them in a small microwave safe bowl. Heat the chocolate in 30 second increments until completely melted. Set it aside and let it cool. Once the chocolate has cooled, in a large bowl, cream together the butter and powdered sugar until light and fluffy. Scrape down the sides of the bowl as needed and add in the vanilla extract and mix until incorporated. Gradually pour the cream into the frosting while mixing. Once the cream mixture is thoroughly mixed into the frosting, fold cooled milk chocolate into the frosting. Increase the mixer speed to medium-high, and beat frosting for an additional 3 minutes. 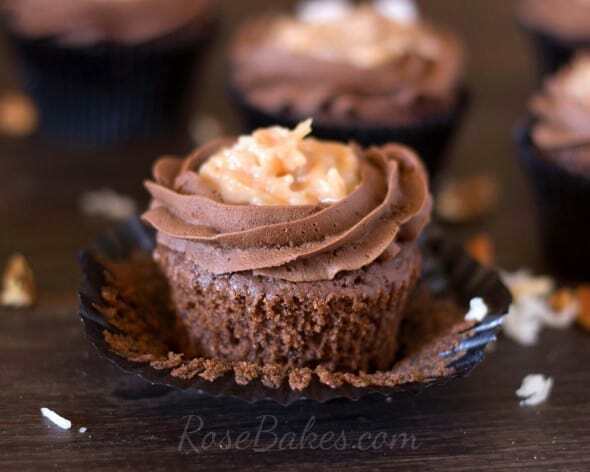 When the cupcakes are cooled, pipe the milk chocolate frosting around the outer edge of the cupcake – forming a “bowl” in the center. I used a 1M tip for this. 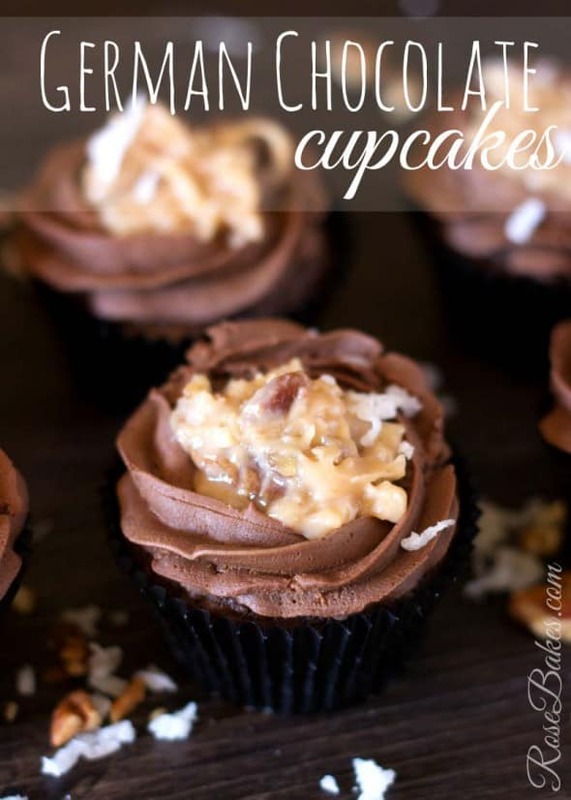 Then using a tablespoon, scoop a dollop of the Coconut Pecan Frosting into the center of each cupcake. In the cake directions you mention adding sour cream. But it is not listed in the cake ingredients. Was it suppose to be left out or added in? Just wanted to know before I make the cake because German Chocolate is my absolute favorite cake. You mentioned sour cream in the cake ingredients but did not mention it in the cake directions. Was the sour cream to be added or left out in the cake? Just wanted to verify and make sure before I make the cake because German Chocolate is my absolute favorite cake and I wanted to make sure before I made it. Sorry, I meant to say sour cream was mentioned in the cake directions and not in the cake ingredients. Sorry about that – I added it! My german chocolate seems grainy. What size pans, oven temperature and for how long would I bake the cake? I want to make the cake. What size pans, temperature and how long would I bake the cake? I used (3) 8″ pans and did thin layers. I baked at 325°F for around 30 minutes. I modified the recipe… first off. I made cupcakes, (filled extra puffy), and cooked for 19 minutes on 325. I’m in a Provo, Utah and am baking at 5214 ft. Still learning about high altitude baking. Added 2 ish T of flour. Probably added extra coconut to the pecan frosting. 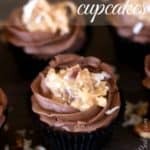 How many days could I freeze these cupcakes(frosting as well as coconut mixture)?